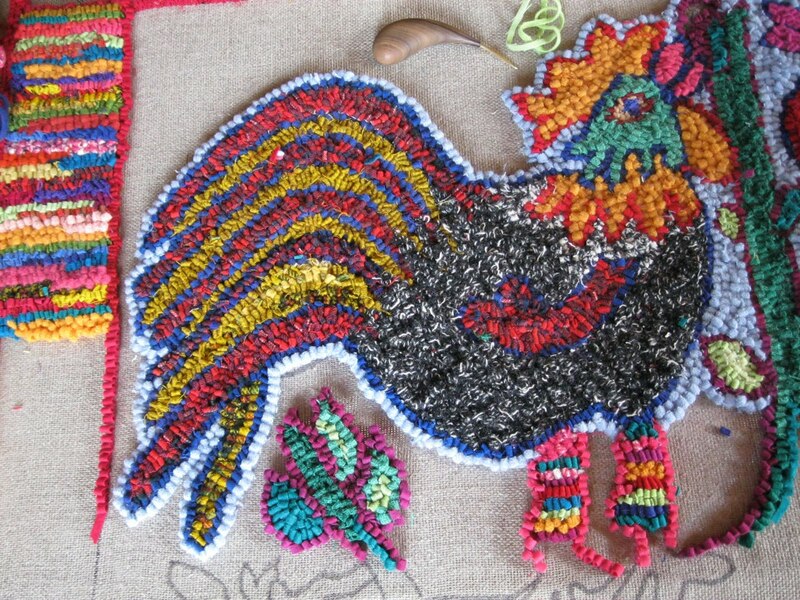 Because of the hot and often smokey days of this past week, I've had quite a lot of time to hook on the rug I started a couple of months ago. It's a design from the Las Rancheritas hooking project in Mexico, so I've been trying to keep that south of the border feeling to it. I blew up the original pattern to make it quite large, and added a border; the side borders I'm doing in hit or miss with as many scraps as I can possibly use up. It has been fun. A couple of days ago, I decided if these girls could have pink lips (beaks), they could also have striped stockings. I'm trying to get this finished before I return to the coast early in August. So...off to hook. Have a great week, wherever you are! Those pink beaks and stripe legs are a hoot! Love the colors and your style of hooking! What kind of a hook is that you are using? Looks downright comfortable! I can tell you're having fun!!!!! I'm so happy you got a kick out of the girls! My hook is from Deanne Fitzpatrick. I LOVE my hooks (I recently bought another one for CA). They are hand made up there somewhere. I was having hand problems using the regular hooks, but these just fit and have stopped the problems. Fun, fun, fun. Those girls make me smile - so bright and cheery. Great job. You have such a flair with colors! 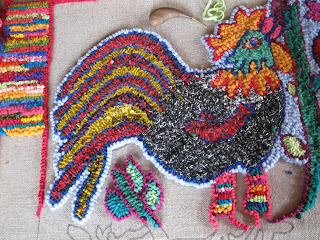 Kim: It's probably a combination of my ancestry and living in NM that makes me crave the colors. Plus, I'm trying extra hard on this one to make it really gaudy. Looks like I'm succeeding! 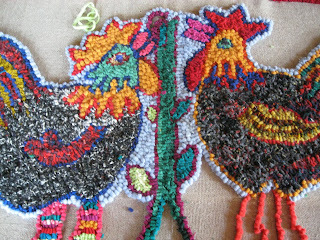 Love the hens...can't wait to see the finished rug. Wow I love these hens. Beautiful work!